These are the actual main doors to the Great Hall, surrounded with stone statues and carvings. Walking through into the Great Hall we are told that we were now walking on the actual stone floor used in the films and seeing the actual tables where the actors ate their feasts. 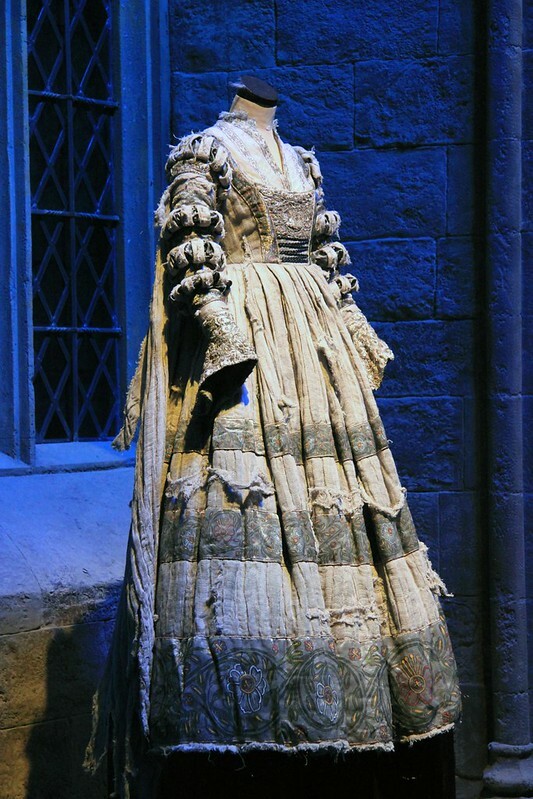 Dummies down each side of the hall wear the actual house costumes that were used in the films: Ravenclaw, Hufflepuff, Gryffindor and Slytherin and not forgetting Moaning Myrtle. At the far end of the hall is the teachers table area, with more amazing costumes worn by Professors Dumbledore, Snape, McGonagall, Moody, Trelawney and Flitwick as well as Hagrid and Filch. Each of the Great Hall torch holders is a carving of one of the four house animals. Though it was rarely seen on screen, prop makers are especially proud of the house point counter, which contains thousands of glass beads. The podium used by Professor Dumbledore is covered in real gold and years of melted wax. Image published by Karen Roe on 2012-06-10 15:52:58 and used under Creative Commons license.